"2018 Black Friday RSD release. 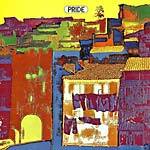 Dig deep in to the released output of famed producer David Axelrod and you'll discover this gem, Pride. The single self-titled release is the pairing of Axelrod with his son Michael. The father-son duo deliver psychedelic pop with what many may call a Baroque folk-rock twist. Issued in 1970, the project is somewhat in the realm of the output from groups such as Love or The Byrds ? but indelibly David Axelrod through and through."